In honor of its 99th challenge, Trifecta has mixed things up a bit. Instead of using the third definition of a provided word to construct a story of 33-333 words, participants this week are free to use any definition of any word found on page 99 of the Oxford English Dictionary to tell a tale in 99 words. One lucky winner will win a $99 gift card…provided there are at least 99 participants! If you’d like to play for a chance to win, head on over to Trifecta and link up! I’d never heard of the Babuyan Islands until this challenge. Turns out they are a small archipelago, part of the some 7,100 islands that make up the Philippines. The islands are beautiful, but largely undiscovered due to their remote location. Getting to the islands is a challenge…the Pacific is particularly rough in that area…unless you are a whale. 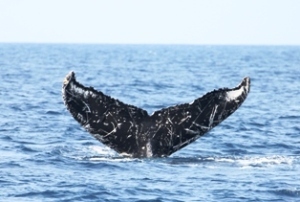 Humpbacks and at least 12 other cetacean species favor this northern Philippine locale as a breeding ground and/or stop on their migratory journey. The Rufford Foundation website, particularly Jo Marie Acebes’ final report detailing the results of her project funded by an RSG grant, provided the backstory for the above dialogue. Oh, Dramamine is a must. Even spotting a whale wouldn’t make me forget the seasickness! but I loved the end, how when you truly love something it never gets old, it never disappoints. That is how you find your bliss I think. Nice! I like that you did your research. You did a really nice job communicating the scientist’s (?) enthusiasm. I don’t imagine that would ever get old. Thanks for being a part of our big 99th!